To demand an end to Louisiana’s giveaways to ExxonMobil, Baton Rouge school employees this week took an extraordinary step: they voted to go on a political strike. Despite a public education strike wave, and the recent uptick in hotel work stoppages, strikes are still a relatively rare occurrence in the United States. For that reason alone, the October 23 decision of Baton Rouge educators to walk out merits the attention and support of working people across the country. But there’s something particularly extraordinary about this action: it would have been an unauthorized political strike against ExxonMobil, the tenth-largest corporation in the world. Incensed by Louisiana’s decades-long policy of granting billions of dollars in tax giveaways to corporations, teachers and support staff voted to hold a one-day school shutdown on October 31 to demand that the school board reject $6 million in additional property-tax exemptions demanded by the ExxonMobil. This was not a decision undertaken lightly. The East Baton Rouge superintendent pledged to keep schools open. Baton Rouge educators quickly won the first round of battle. Just twenty-four hours after teachers and schools staff approved their walkout, ExxonMobil’s proposed tax exemptions were scratched from the upcoming state board agenda. To discuss the roots and meaning of this movement, Jacobin’s Eric Blanc spoke with Angela Reams-Brown, president of the East Baton Rouge Federation of Teachers, and Tia Mills, president of the East Baton Rouge Parish Association of Educators. Can you give our readers some sense of the conditions facing educators and students in Baton Rouge? The building I teach in has been condemned, set for demolition for many years. So, every day I get a direct look at what underfunding means for our students and I spend a lot of time thinking about the great education we could provide if only we had the funds. No matter how bad things are in our schools, we have to make the best of it for our students. I personally spend over $1,000 for my classroom, just to make learning possible. But it’s hard because the cost of living keeps going up, rent keeps going up, and school employees in our district haven’t received a raise for over ten years. I have a doctorate, but I make less than $55,000, and I have to work two jobs to survive. Most of our teachers here have to do the same. We knew we wouldn’t be getting rich by becoming educators, but we didn’t expect to be on welfare. And it’s even rougher for other staff in our schools: A lot of bus drivers and secretaries are making $30,000. That’s a poverty wage, not a living wage. After we called for the October 31 walkout, our superintendent Warren Drake immediately responded by saying that a work stoppage was “not the right way” to go about getting more funding. Instead, he told us we should be grateful for the increases we’ve gotten. He said, word for word, “‘Whatever happened to, ‘Thank you?’ I don’t hear much of that.” But we haven’t gotten an across-the-board raise, or even a cost of living increase, since 2008. Personally, as a thirty-three-year veteran teacher, what is there to say “Thank You” for? Would you also say that education underfunding is a racial-justice issue in Baton Rouge? Some people might see it that way. Ninety-seven percent of students in our district qualify for free or reduced lunch, and majority of students in our districts are Black or Brown. But the way I see it, this is an across-the-board problem facing public education — most of the districts in my state are dealing with similar issues. One recent report showed that Louisiana’s local governments are losing $1.9 billion yearly in revenue from property-tax exemptions for corporations made possible by the Industrial Tax Exemption Program (ITEP). If I understand correctly, a major reason for the underfunding of schools in your district are exemptions granted to ExxonMobil? We’re not just against Exxon, we’re against any business that comes in to take money from our school and our children. Our school board for years has rubber stamped virtually every single exemption, and not just for Exxon. The board just says “Yes, Yes, Yes” to everything. The result is that our school district is currently operating at a $22 million deficit; we’ve had to cut our reserves in half over the past two years. 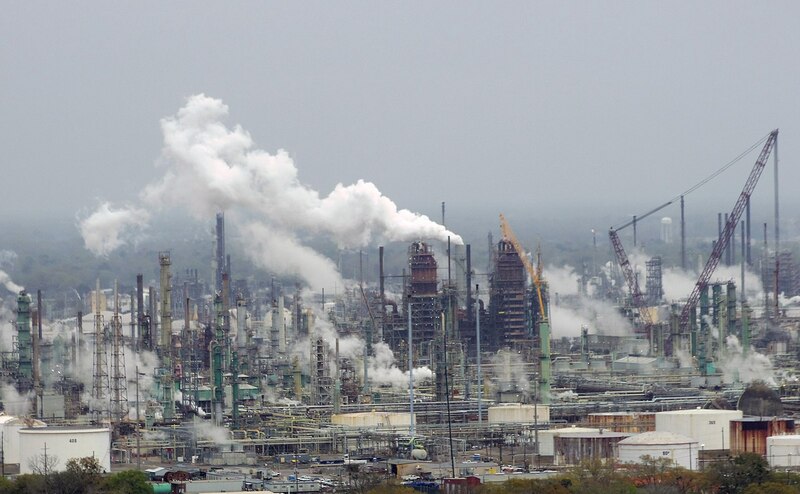 Exxon is already not paying its fair share in property taxes. And now it comes to us demanding an extra $6 million in tax exemptions for projects that were completed in 2017 and that didn’t even create any jobs. We called the walkout in our district to stop these new exemptions. We’re talking about billions of dollars in giveaways. In Louisiana this policy of property-tax exemptions goes all the way back to the 1930s. We urgently need every single one of these dollars to remain in the district. Unfortunately, some school-board members have agendas of their own. Honestly, some of them don’t want our district to get this money. But the survival of public education is at stake — we’re already losing $60–70 million locally to charters. It should be the duty of our elected officials to listen to their constituents. The thing is: we’re going up against Exxon. They’re a very powerful player in local politics and in other places Exxon has bullied districts to accept all exemptions. Can you explain how your movement began? The first steps to start organizing against ITEP exemptions started about a year and a half ago. But the rumblings for a walkout started last May, after the strikes in West Virginia, Oklahoma, and elsewhere. People were really inspired by those statewide walkouts. I watched the news and I read about them in articles online. It was inspiring, because all of sudden you have ordinary people fighting for what was right, fighting on their own behalf. It’s also important to keep in mind that there was a teacher strike here in the late 1970s. We still have that culture around, because many individuals in the school system were children at that time. We have a lot of courage to fight, because we watched our parents and grandparents stand up for what is right. Lots of folks were fired up to walk in May, last spring. But we explained to our members that to win, we needed to have a clear issue and clear demands to fight for. We didn’t have that yet. But since last May, we’ve been presented with the four proposed ITEP exemptions. We realized that this would be an ideal time to make our concerns known to the community and to the school board. We knew that the sentiment to fight was there among our school employees, but we needed to organize it. So, we started doing one-on-one and group discussions with our members at the school sites, and we used every tool we had: email, phone, Facebook. We’d always ask our coworkers one key question: “What are you willing to do to make your voice heard?” As we talked to them, it became clear that a majority of educators were more than ready for a work stoppage. And you were organizing not only teachers, but all school employees, right? That was also one of the key ingredients of West Virginia’s success. Exactly. We wanted this to be a real movement of all school employees, not just teachers. Teachers can’t teach by themselves. It takes a whole family: a school can’t run without its bus drivers, its paraprofessionals, and its clerical staff. So, we invited all employees, except administration, to participate in the movement. Everybody — no matter if they were in a union or not and no matter which union they were part of — was invited to collectively discuss and vote at our October 23 meeting to decide on whether they were willing to walk out for our schools. In ordinary times we wouldn’t have to be here tonight, and we wouldn’t have to make the decision we’re making tonight. But these aren’t ordinary times. These are unusual times. Extraordinary times. In extraordinary times, people who ordinarily are led often are called upon to lead. People who typically are directed are called upon to direct. People who usually do not bear the burden of policy formation must take up that burden because those elected and appointed to carry it have shown themselves incapable of doing so. These are not ordinary times. And in extraordinary times, ordinary people must rise to the occasion and do extraordinary things. That’s what we’re doing here tonight. Can you tell us more about the meeting and the decision to walk out? It couldn’t have been easy for people to take this risk. As union leaders here, we often have had to focus on mobilizing only tenured teachers because, honestly, others are often too scared to get involved. If you don’t have tenure, they can just dismiss you like that, with no hearing or anything. A lot of people were initially nervous, which is one reason why we didn’t let any media or administrators into the October 23 meeting — we wanted to make sure people felt safe to talk. Once folks came into the meeting, once they saw all their coworkers, the mood became one of excitement. There were hundreds of us there, packed into the [Shiloh Missionary Baptist] church. It’s pretty remarkable what you all have done — it’s not every day that you see working people dare to go up against such a powerful corporation. And, so far at least, it seems like you’re winning, since the day after your strike vote it was announced that the proposed ITEP exemptions for Exxon were not included in the upcoming board agenda. Yes, it was a small victory – the exceptions were pulled off from the next board meeting’s agenda. But we’re still waiting to see whether they’re scrapped all together. The members of the Support Our Educators Coalition are therefore postponing the walkout planned for October 31st, permanently if the exemption requests do not return, temporarily if they are placed on a subsequent agenda. If these after-the-fact exemption requests do return, so will our fierce opposition to their approval, along with our commitment to assure that public school funds are used for the purpose for which they were intended and voted on by our citizens – for the public education of our students. We’re going to keep on fighting back, because this struggle is for the children — period. This is our opportunity to make things right. Tia Mills is president of the East Baton Rouge Parish Association of Educators.